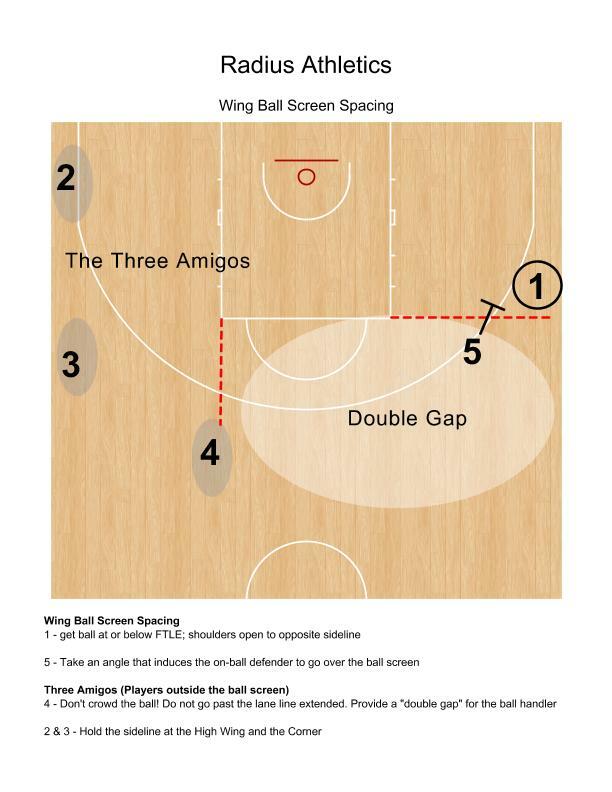 Tips for creating an advantage using the wing ball screen from the break. Symmetry and floor balance are primary goals of transition offense. Arriving in the frontcourt spaced and balanced allows offense to flow. However, the randomness of the game, especially after a live-ball change of possession, does not always make this possible. Nonetheless, getting inside the defense and creating an advantage as soon as possible is still the offensive goal. In the diagram below, Player 1 receives the outlet with no ballside wing ahead. He/she cannot pitch ahead, but they do have the advantage of an empty side to attack with the dribble. 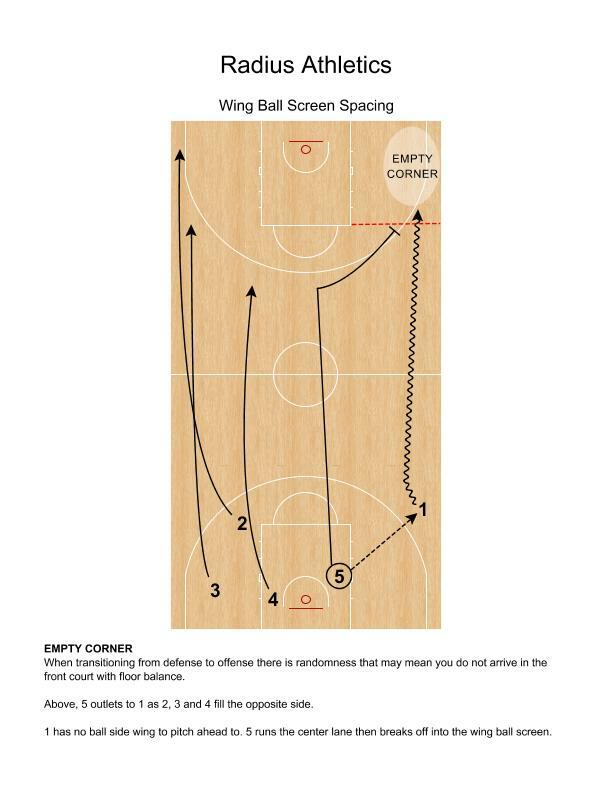 If they are unable to turn the corner and score, settling at the wing would cue the trailing big to veer over and set the wing ball screen. Seamlessly, we have an early action designed to create an advantage for the offense. The offense can use the wing ball screen when the corner is filled but no pitch ahead is available by using the dribble push. Player 1 races the ball up the alley and waves Player 2 through with the dribble push. Player 2 fills opposite corner and Player 3 bumps up to the high wing. Player 1 can turn the corner to score or settle on the wing. 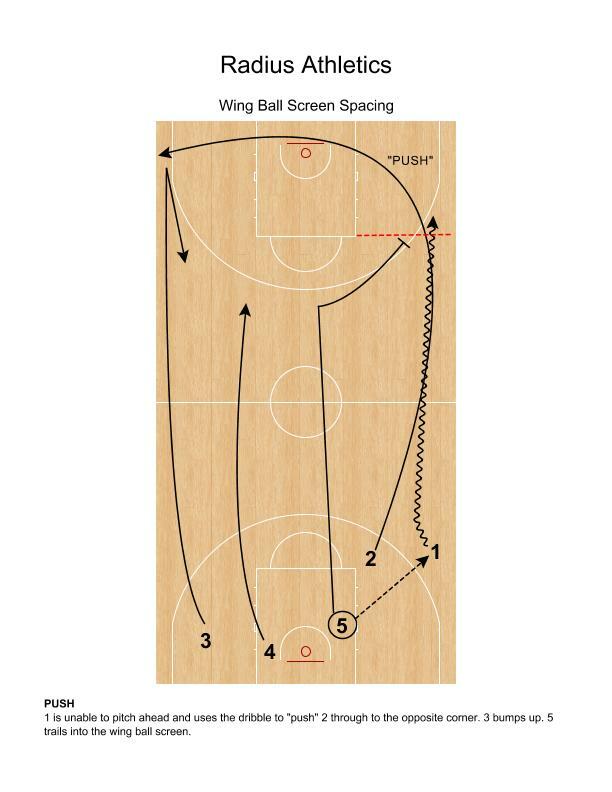 Again, settling on the wing cues the trailing big to set the wing ball screen. Player 1 gets the ball just below Free Throw Line Extended (FTLE) and faces the opposite sideline. The big who was filling the center lane (Player 5 as diagrammed) veers over to set the wing ball screen. A big spacing key, Player 4 must not ease too close to the mid-line of the court. Stay wide (over the lane line opposite the ball screen) to provide a “double gap” for the ball handler should they accept the screen. Flowing from transition offense to half court offense should not be interrupted by a slight tilt of the floor. 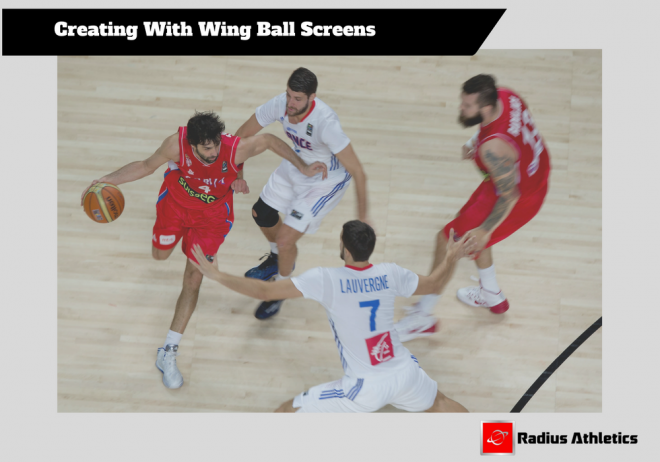 Using the wing ball screen to create an advantage in these instances can be accomplished without that “set it up” moment or a call from the bench if players are taught to recognize these situations and react accordingly.